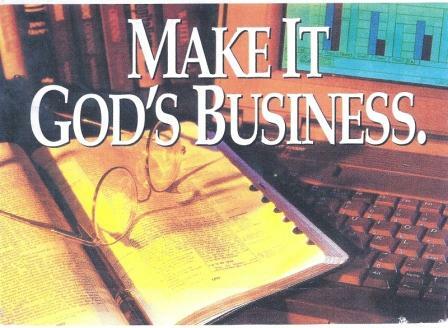 Making It God’s Business! What is God's Business? How could we include God or Spirit in Business? Now I realize that some people don’t resonate with the word God. I like to spell the word God with the infinity symbol for the O because to me, God is Infinite Good, the Universal Creative Power that Ernest Holmes described in Creative Mind. Ever since I first heard the term, Spirit in Business, I have resonated with the vision of incorporating spiritual principles and practices in businesses. As a former disaster relief expert, a Community Economic Development specialist and as someone who has lived and worked in spiritually (not religious) intentional communities for over 25 years, I personally feel the lack of values and principles in business has been a major influence in the economic crises we face nationally and globally. Now with the new Benefit Corporation model, we can actually incorporate a cause-oriented company dedicated to helping further whatever we would define as God’s Business, Imagine That! How would you envision such an enterprise? What would you include in the Articles of Incorporation, the Mission and Purpose Statement and or the Business Plan? Please do share your insights as a few associates and I are actively proceeding with plans to help establish a network of Spirit In Business Benefit Corporations. Thank you! Tom's insightful documentary provides background on why we incorporated Universal Stewardheirship, Inc. and the Community Economic Development Resource Center, Inc. based on the new Benefit Corporation model. It also validates the reasons we are launching the Expanding the Circle of Success campaign to help answer the two questions his documentary ends with: What's right with our world? and How can we help manifest what we refer to as Earth Stewardheirship? The word StewardHeirShip™ incorporates Spirit, Service, Stewardship, and Sustainability. Universal StewardHeirShip, Inc. is a company based on the Benefit Corporation model and Community Economic Development. 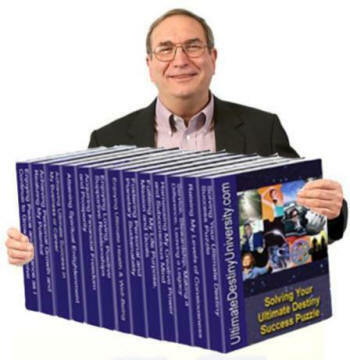 US, Inc. publishes, produces and distributes resources for Solving Personal, Community and Global "Ultimate Destiny Success Puzzles." Our books introduce StewardHeirShip and present our vision for helping individuals, organizations and communities realize and actualize more of their capacity for addressing the increasing social, economic and environmental challenges we face. US, Inc. will allocate 40% of the shares to affiliated non-profit organizations including CENTER SPACE and Ultimate Destiny University. Universal StewardHeirShip Helps Individuals, Organizations and Communities A.R.K. S.P.I.R.I.T. When we use the words spirit and spiritual, we're not talking about religion. We define those words as Stewardship; Purpose; Integrity; Responsibility; Inspiration and True identity (remembering we are spiritual beings having a spiritual experience temporarily in a human form). We deeply appreciate the work of Judi Neal, Director of the Tyson Center for Faith and Spirituality in the Workplace and Patricia Aburdene’s great work in Mega Trends 2010, Seven Trends That Will Change the Way We Live, Work and Invest. She reported in her book that 3 of the 7 trends were spiritual and the most significant trend was spiritual, especially in the world of business. Our Answer to the Question "How to design a spiritual business?" A few years ago at a Social Venture Network annual membership meeting, one of the codirectors invited me to help facilitate a group conversation focused on how to most effectively discuss the initial inclusion of Spirit as one of the core foundational principles of SVN. I don’t remember now exactly how I shared an acronym for S.P.I.R.I.T. I said it included components such as: Stewardship; Purpose; Integrity; Responsibility; Inspiration and True identity (remembering we are spiritual beings having a spiritual experience temporarily in a human form.) There was a wonderful response. Of course we had already covered the difference between spiritual and religion in the conversation and I am sure most of us were familiar with Patricia Aburdene’s great work in Mega Trends 2010, Seven Trends That Will Change the Way We Live, Work and Invest. She reported in her book that 3 of the 7 trends were spiritual and the most significant trend was spiritual, especially in the world of business. As a result of the influences of fellow members back then in SVN, Spirit in Business, World Business Academy, Association for Spirit at Work, IONS, the Association for Global New Thought, etc, the cofounders of Universal Stewardheirship, Inc. set our intentions on designing a cause-oriented company based on the 4Ps of Purpose, People, Planet and Profitability. We hired Pat Sullivan (VisionPat@aol.com) to help us learn how to apply her powerfully effective innovative model for developing a spiritually-based business plan. We highly recommend Pat’s services! Over the past few years, we have discovered that if we tune into Spirit, Inner Guidance, the Creative Force or Source Energy, whatever one calls the Infinite Power, the “Divine Design” inherent in anything, including a business, will reveal itself rather than our having to DO anything other than BE STILL, LISTEN, LET GO AND LET SPIRIT and take only appropriate ACT/I/ON. Now I certainly don’t claim that we haven’t made mistakes or that we haven’t often gotten in the way of that Divine design unfolding. In fact we have cocreated some fascinating new tools such as Discernment Grids for discerning the difference between what we referred to as a “Divine Appointment” or a “Devilish Distraction” as we attracted and sought alignment and coherence with potential strategic alliance partners. We became familiar with techniques from HeartMath® that helped us individually and as a team enjoy the state of “heart-mind coherence”. Before our board meetings we frequently would begin with an exercise we learned from HeartMath known as a “heart-lock in” which always magically seemed to produce greater clarity, synergy, alignment and deeper access to Universal Wisdom available from within. In the past few years, we have steadily made progress in actualizing our shared vision of cocreating a company that would facilitate our mission of helping millions of people A.R.K. – Awaken to our true identity as spiritual beings (having a spiritual experience temporarily in a physical body); Realize more of their inherent potential; and Know how to cocreate their ultimate destiny (whatever that means to each individual). What is Spirit’s Vision for our enterprise? What do we have to be or become to allow Spirit’s vision to manifest? What do we need to let go of to allow Spirit’s vision to manifest? What is the Gift of Spirit that I personally bring? Is there anything else I could know or receive from Infinite Wisdom? We have generated several hundred thousand dollars in equity capital (mostly from our cofounders who have deep spiritual underpinnings, including New Thought Ministers and Practitioners who had sold successful businesses when they were called into a ministry). AND we have turned down over twenty million dollars from potential investors whose motives and priorities did not feel in alignment with our spiritually centered vision and mission. After years of preparation, research and development, we are about to launch 14 stand-alone titles in our Ultimate Destiny Success System. We are also launching a campaign to help Expand the Circle of Success (www.ultimatesuccesspuzzle.com), partly by establishing a network of local non-profit Community Economic Development (CED) Empowerment Resource Centers. The field of CED includes Self-Help, Empowerment and Capacity Building. The Resource Centers based on about 40 years of (mostly award-winning) prototypes will provide expanded access to state-of-the-art development training programs including Successful Living Skills for the 21st Century. In addition to the traditional success skills, we include training on many more “spiritually centered” techniques such as: Visioning and Visualization; Prayer and Meditation; Effective use of affirmations; Centering Practices, MasterMinding; Collaboration; and the Spiritual Principles and Practices known as New Thought including Spiritual Mind Treatment (based on Ernest Holmes work in The Science of Mind, Creative Mind and Success), etc. We have also developed a Strategic Marketing Matrix™ (www.strategicmarketingmatrix.com) for helping introduce 100 million people to New Thought Principles and Practices (as taught at Unity and Science of Mind Centers. And we are presently in the process of publishing two new books. The first of these, Solving Our Personal, Community and Global Ultimate Destiny Success Puzzles will introduce our Strategic Implementation Matrix for establishing the network of CAN DO! CED Resource Centers as described at http://www.ultimatesuccesspuzzle.com and www.communityresourcecenters.org. The second book, Solving the Ultimate Destiny Success Puzzle for the United States of America, incorporates Benjamin Franklin’s statement that “The destiny of America is not power. It is Light” (More details are available at http://www.ultimatedestinyoftheusa.info and our Facebook page at http://www.facebook.com/pages/Fulfilling-the-Ultimate-Destiny-of-the-USA/228213693895984). In December 2010, our Ultimate Destiny board of directors approved my suggestion that we establish a new entity as Universal StewardHeirShip, Inc. and roll all of our intellectual properties and assets into it. We will also allocate 40% to 50% of the founders shares to non-profit organizations, including those we had cofounded (such as CENTER SPACE, the Center for Spiritual, Personal And Community Enlightenment and the Ultimate Destiny University for Successful Living). We will also donate shares and tithe to NPO’s we appreciate and support such as The Institute of HeartMath, The Love Center, Social Venture Network, IONS, the Foundation for Inspired Learning, etc. The details of that continuing process and invitation to participate are described at www.UniversalStewardHeirShip.com and our Facebook page at www.facebook.com/universalstewardheirship. Thanks for asking the question Graham. Living a life of joyful daily exploration of your question by tuning into Spirit with a dedicated team of cocreators who share Bucky Fuller’s vision for “betterment for 100% of humanity”, is the richest and most rewarding experience of my life. After all, isn’t life itself a University for Successful Living as we discover how to fulfill our ultimate destiny of and learn how to serve as loving cocreators and StewardHeirs of heaven on earth? PS. We also are developing what we refer to as a S.M.A.R.T.E.S.T. "Arisory team". It is based on the significance of a MasterMind reported by Napoleon Hill in Think and Grow Rich and Brian Tracy's teaching that our "frame of reference group" is one of the most important factors that determine our level of success in life.